You know, BK must be loving all the attention it got this week. I mean, the new bacon sundae was on NPR's morning edition for crying out loud. I then get out of my car, walk into work, and everyone is debating the merits of bacon and ice cream. We firmly had the usual two camps of "this is awesome" and "that's just crazy"... oh alright, I admit it was fun to hear a little ice cream banter at work. Well... I went to BK and all I got was some poorly made Brownie Sundae sans Bacon. I mean, I won't argue that it's pretty awesome looking with those brownies sticking out, but there was no site or sign of bacon-y goodness on the BK menu (and in their defense, I did not ask since I was in a terrible hurry). So, I settled on something that was new as of the end of last year. That's right, I sat there patiently waiting for my plain old boring sundae while a man on a giant rock in the middle of the pacific un-frighteningly enjoys his Bacon Sundae. That's not right... or something. I mean, I'm happy Marvo got one, but don't we all deserve bacon? Actually I wouldn't be complaining had my sundae actually been made decently. Would it kill them to heat my brownie? And for that matter, it's called HOT fudge for a reason. I don't even know if I should call this one a "double brownie sundae" since there are two brownie chunks, or is this supposed to be the "Oreo brownie sundae" because I sure don't taste any Oreos. Uggg, have I mentioned the hot fudge was real room temperature fudge? At that temp, it wasn't very tasty. It was strong but the flavor could have been much better. I want gooey sauce on my sundae, not thick and potent. (note: apparently BK never puts the hot in their hot fudge). The brownies were decent, neither spectacular nor awful. Somewhat heavy, not too gooey or oily, or to dry. I guess unremarkable would be the word. This sundae really only had one thing going for it : it was HUGE! As the manager handed me the sundae I was shocked at how big it was. I realized that this would have been more than enough to fill me for lunch. It's gigantic and explains why it's over 500 calories. I guess it's more brownie a la mode? The two large chunks are how I saw it advertised, but I would probably prefer a few more chunks as well. Come to think of it, the new bacon sundae seems to be large slices rather than pieces as well. 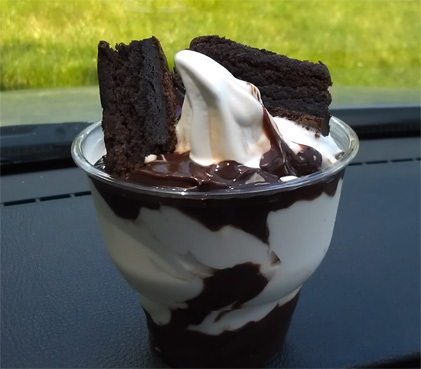 It was a long time ago, but I want to say the DQ version has a brownie on the bottom and brownie bites on top. I also loved the fact this was huge, but I did wind up wearing it when I first tried breaking up the big brownies. You silly thing...hot fudge only stays hot for mere seconds when in the company of ice cream. true, but the hot fudge should at least be warm and gooey (like it is at DQ), not solid and room temp. there's just no fun in that.